The name means “dirty duck” in Bahasa. But don’t let the name fool you: this is not another hole-in-the-wall food stands where sweaty patrons slouch over plastic tables and spit on the floor. On the contrary, the restaurant is set in a luscious garden graced with fruit trees and fish ponds. As the maître d’ ushers you down the meandering stone path to your table, you may well think you have entered a luxury spa instead of a family restaurant. 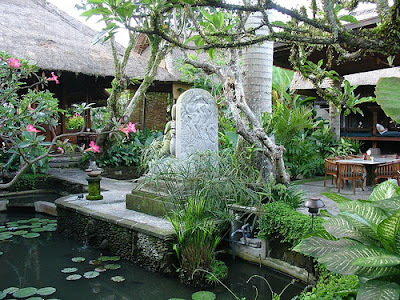 Located in the historic town of Ubud in southern Bali, Bebek Bengil is popular among both locals and tourists. 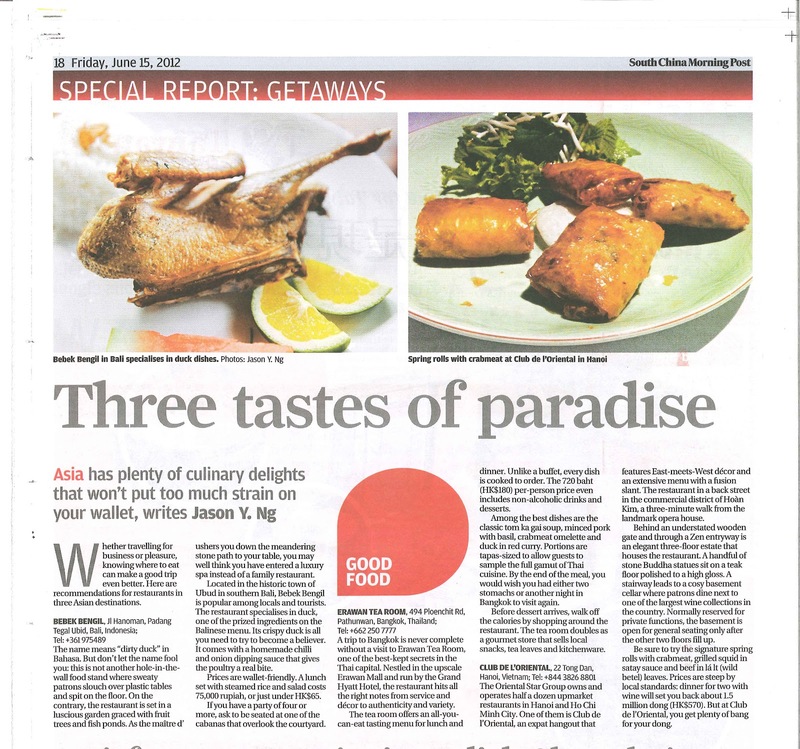 The restaurant specializes in duck, one of the prized ingredients on the Balinese menu. Their famous crispy duck is all you need to try to become a believer. It comes with a homemade chili-and-onion dipping sauce that gives the poultry a real bite. Prices are wallet-friendly. A lunch set with steamed rice and salad costs IDR75,000, or just under HK$65. If you have a party of four or more, ask to be seated at one of the cabanas that overlook the courtyard. A trip to Bangkok is never complete without a visit to Erawan Tea Room, one of the best kept secrets in the capital city. 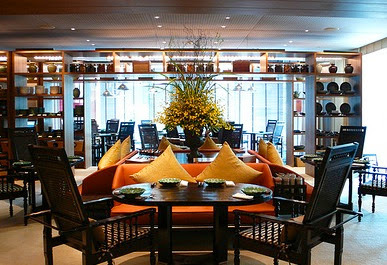 Nestled in the upscale Erawan Mall and run by the Grand Hyatt Hotel, the restaurant hits all the right notes from service and décor to authenticity and variety. I go there so often that I now know every server by their first name. The tea room offers an all-you-can-eat tasting menu for both lunch and dinner. Unlike a buffet, every dish is cooked to order. The BHT720 (HK$180) per person price tag even includes non-alcoholic drinks and desserts. Among the best dishes are the classic tom ka gai soup, minced pork with basil, crabmeat omelet and duck in red curry. Portions are tapas-sized to allow guests to sample the full gamut of Thai cuisine. By the end of the meal, you would wish you had either two stomachs or another night in Bangkok to visit again. Before your desserts arrive, walk off the calories by shopping around the restaurant. The tea room doubles as a gourmet store that sells local snacks, tea leaves and kitchenware. The Oriental Star Group owns and operates a half dozen up-market restaurants in Hanoi and Ho Chi Minh City. One of them is Club de l’Oriental, an expat hangout that features east-meets-west décor and an extensive menu with a fusion slant. The restaurant is tucked secretly on a back street in the commercial district of Hoàn Kiếm, a three-minute walk from the landmark opera house. Behind an understated wooden gate and through a Zen entryway is an elegant three-floor estate that houses the restaurant. A handful of stone Buddha statutes sit quietly on a teak wood floor polished to a high gloss. 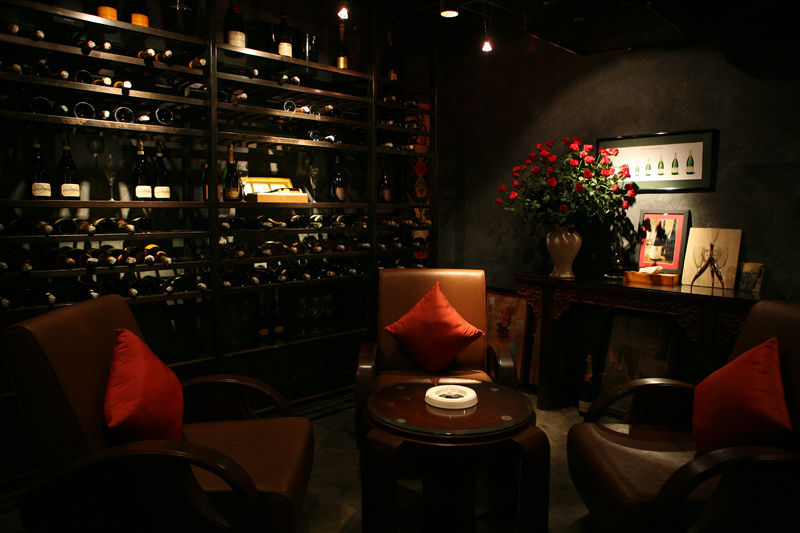 A stairway leads to a cozy basement cellar where patrons dine next to one of the largest wine collections in the country. Normally reserved for private functions, the basement is open for general seating only after the other two floors fill up. Be sure to try the signature spring rolls with crabmeat, grilled squid in satay sauce and beef in lá lốt (wild betel) leaves. Prices are steep by local standards: dinner for two with wine will set you back around VND1,500,000 (HK$570). But at Club de l’Oriental, you get a bang for your dong. These restaurant recommendations previously appeared in the 15 June 2012《Life STYLE》supplement of The South China Morning Post. I have been to 2/3 so will definite make Bangkok the hat trick. Good article!